We are big tea drinkers in my home. 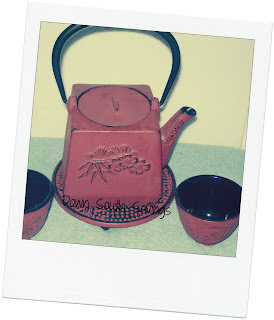 I had always seen beautiful tea kettles and thought how I'd love to have one! Well thanks to Enjoying Tea, now I do! I contacted them about reviewing their products and got an immediate yes. I couldn't wait to get it in the mail! 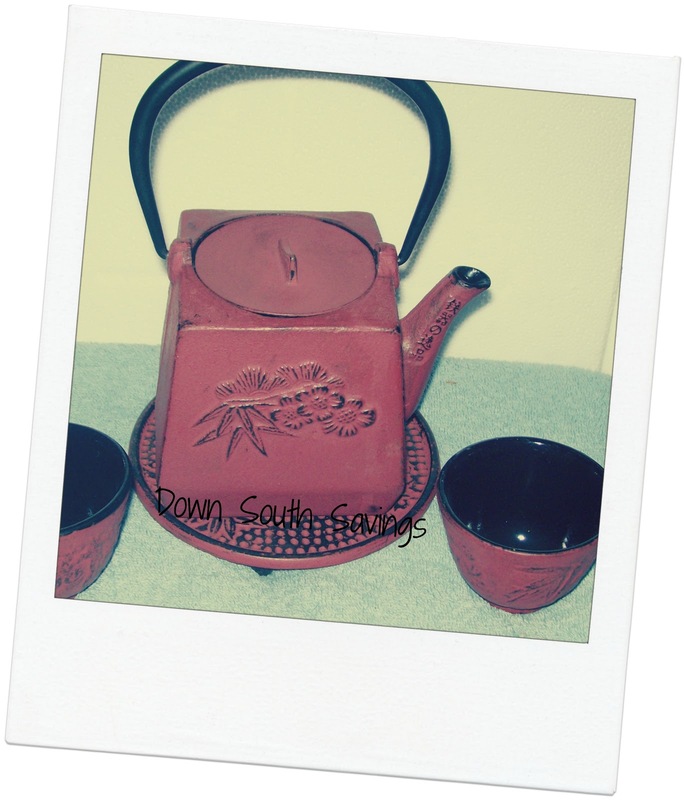 I chose the Red Peony Flower Iron Cast Tea Set. As you can see it is really pretty. (Heavy too I might add) The set is cast iron and very durable. It looks great sitting on the stove or in a curio cabinet. Would even make a great center piece on your kitchen table. Enjoying Tea has many different tea sets to choose from. I chose the cast iron because it's durable. Trust me when I say it's durable because unfortunately while moving one of the little cups I dropped it on the floor and it didn't break. I thought I would die and my husband said "It's fine, it's cast iron, even you can't break it"
When you purchase any tea set or tea pot from Enjoying Tea they will also send you free tea! That way if you are caught unprepared with no tea when it arrives, you will have it right there with the kettle! I'm extremely happy with my tea set! It's my first one ever and I'm sure it will make it's way into the homes of my children one day. Enjoying Tea offers free shipping with any purchase over $60.00 and flat rate ground shipping of only $3.98 for anything under. I would recommend them to anyone asking about a good quality tea set or kettle. My experience was great! This would make a great gift too for that hard to buy person! Disclosure: I received no compensation for this publication. I did however receive the above mentioned product free of charge for review purposes only. My opinions are those of my own and may differ from those of your own. I was not required to write a positive review. I am disclosing this in accordance with the Federal Trade Commision's 16 CFR, Part 255: "Guides Concerning the Use of Endorsements and Testimonials in Advertising." That's so pretty! I'm jealous! Gonna have to go get one myself! FREE LASIK Evaluation PLUS Free Info Kit! High Value Jamba Juice Printable Coupon! WIN 4 nights a a Country Inn and Suites! Dolly and Me Special Coupon Code! MANGROOMER/LADYGROOMER Review and Contest Info! Burger King Voucher is BACK!!! HURRY!!! Honest Family Essentials Free Trial! Teen Boys New Balance Tees only $7.99! Make Money Online and While Shopping! $5 off $15 Plus refer a friend bonus! $20 Amazon Gift Cards Instant Win Game!! Fifty Shades Of Grey Anyone? $40 Cash OR Gift Card Flash Giveaway!